A thrust theatre has audience members on three sides of the stage, leaving one side for taller scenery. It is sometimes called "three quarter round". The Ancient Greek and Elizabethan stages were thrust stages; the major benefit of this style of stage is that it brings the actor into closer proximity with the audience. Three front rows along each of three sides of the stage means that many more audience members will be close to the actors. On the other hand, the areas for scenery storage and the methods of hiding scenic machinery are greatly reduced. Tall scenery (walls, backdrops) cannot be placed anywhere except on the one side of the stage where no one is seated. Theatrical illusion is greatly reduced on the thrust stage because most audience members will not see a framed theatrical event but will see both the events on the stage and across the stage to audience members seated opposite. Thrust theatres have regained popularity in the twentieth century. Famous theatres with thrust stages today include the Guthrie Theatre in Minneapolis (see photo), the Olivier at the Royal National Theatre in London, and the Festival Theatre in Stratford, Ontario. Most terms for parts of the proscenium stage are the same, or slightly adapted, in a thrust theatre. For example, up and downstage are relative to the one wall with no audience seating. Some terms do not apply; there are rarely fly lofts or wings in a thrust theatre. An additional structure often found is the vomitorium, a structure for performers' entrances that originated in ancient Roman theatres. This is a ramp that begins underneath the audience seating and leads to the downstage end of the thrust stage; often there are two vomitoria -- one leading to each downstage corner. It is used to bring actors and scenery on and offstage. An arena stage has audience members seated on all sides of a square or circular stage. It is the oldest kind of performance space, dating back to ancient rituals probably before recorded history. No such buildings remain today; however, the circular orchestra found in the ruins of ancient Greek theatres point to older performance traditions before the construction of stone theatres. 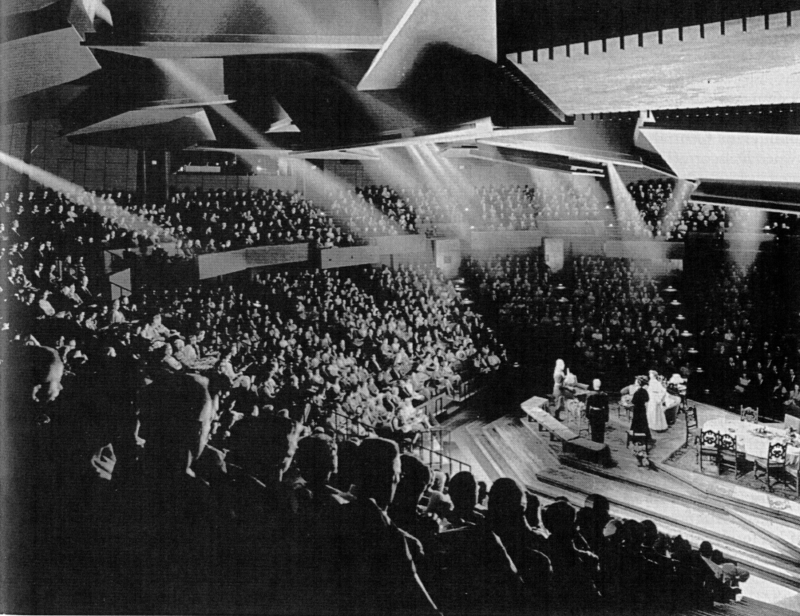 An arena theatre maximizes the connection between performers and audience, while minimizing the possibility for theatrical illusion. Many arena theatres have been built in the second half of the twentieth century; they include the Arena Stage in Washington D.C. and Circle in the Square in New York City. Throughout the twentieth century theatre practitioners have considered different theatrical arrangements appropriate to different kinds of plays or different playing styles. The German director Max Reinhardt was among the first to advocate a theatre complex in which there are several kinds of theatres, such as a large proscenium or thrust house and a smaller arena stage, and to suggest that different plays require different kinds of theatres. NewYork's Lincoln Center, London's Royal National Theatre and Barbican Center, Atlanta's Alliance Theatre, and Chicago's Goodman Theatre are examples of such theatre complexes. 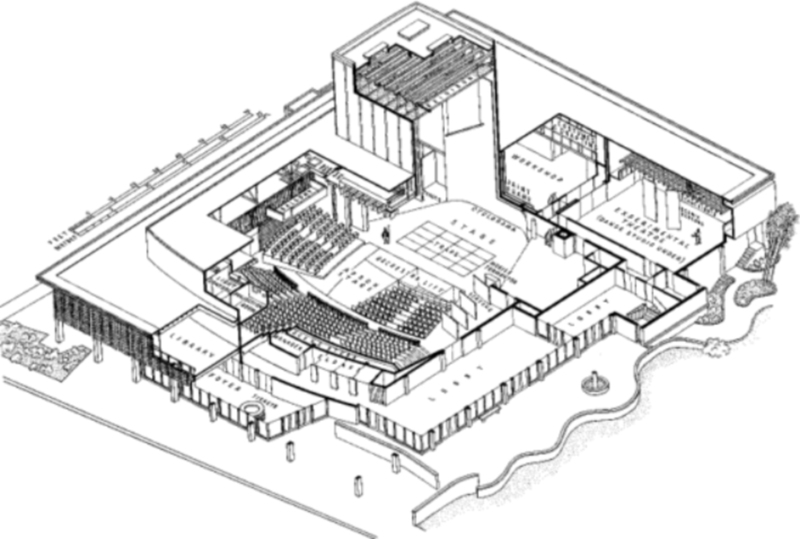 A similar twentieth century trend is to design a flexible theatre in which the audience and stage areas can be rearranged to form any of the three basic arrangements. The American Repertory Theatre's Loeb Center (see photo) in Cambridge is an example. The black box theatre (such as we have at Geneseo) is a simple solution to the theatre artist's desire to make the space fit the production: it is simply a room painted black, in which audience seating, stage platforms, lighting and scenery can be placed anywhere in the room and changed for each play.